Ed Sander Memorial Cyclocross, the first race in the MABRAcross series, takes place September 26. To give you an idea of what the day has in store, I sat down with Ken Woodrow, a MABRAcross technical advisor and member of Squadra Coppi, to preview the course. 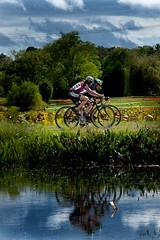 Ed Sander offers varying terrain and a unique take on your traditional cyclocross course. If it’s dry, get ready to fly. Raining out? Better have your running shoes. As always, let us know what you think about these course previews or anything else at CXHairs.com. Leave a comment or shoot an e-mail to CXHairs@gmail. There is an e-mail link over there on the sidebar. I DON EVEN KNOW WHAT TO SAY, I THINK YOU SAYS IT ALL FOR ME. Good job guys. Well done. I think these previews w/ commentary are awesome. The Charm City posting really helped me out w/ what to expect on my pre-ride laps, this one will as well. Keep up the previews – they’re much appreciated! These reviews are Gold! Great resource. Thanks for doing these! Extremely helpful. One suggestion – could the video not be set to ‘private’ on vimeo, so that we can watch these on the vimeo site rather than only as a small embedded video? Good stuff, maybe we can get you out for a pre-ride on the DCCX course because there are some changes this year. You can watch the image full screen. It’s the button in the lower right with four arrows pointing out.